Textbooks will tell you that the term 'bug' should be restricted to insects of the order Hemiptera though, as I've noted before, I don't know if I've ever met anyone who actually used the word that way. For many people, one of the groups of actual bugs that they are most likely to be aware of are members of the Cicadomorpha. Tasmanian hairy cicada Tettigarcta tomentosa, copyright Simon Grove. Cicadomorphs include the cicadas (Cicadoidea), leafhoppers (Membracoidea) and spittlebugs (Cercopoidea). As a group, they are distinguished by an enlarged postclypeus (the upper part of the front of the head below the antennae), simple antennae with a whip-like flagellum, and small and narrowly placed mid-coxae (Dietrich 2005). The enlarged postclypeus is associated with adaptations for feeding on xylem, deeper in the plant stem than many other plant-sucking bugs prefer, though derived subgroups of the leafhoppers have changed back to phloem or parenchyma. Well over 30,000 species of cicadomorph are known from around the world. 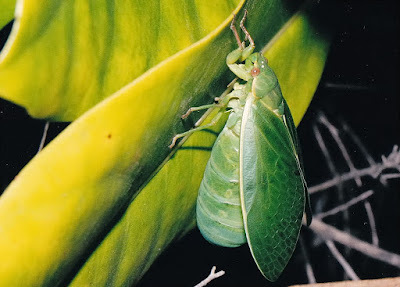 Cicadas can be readily distinguished from other cicadomorphs by their possession of three ocelli in a triangle on the top of the head whereas leafhoppers and spittlebugs have only two or no ocelli. Male bladder cicada Cystosoma saundersii, one of the world's more ridiculous animals, from Brisbane Insects. Cicadas are best known, of course, for their singing. The songs are produced by a pair of membranous 'drums', the tymbals, at the base of the abdomen; muscular vibration of the membranes produces the sound. In most cicadas, only the male possesses these tymbals. However, both sexes possess tymbals in the hairy cicadas Tettigarcta, two species found in alpine regions in south-eastern Australia. 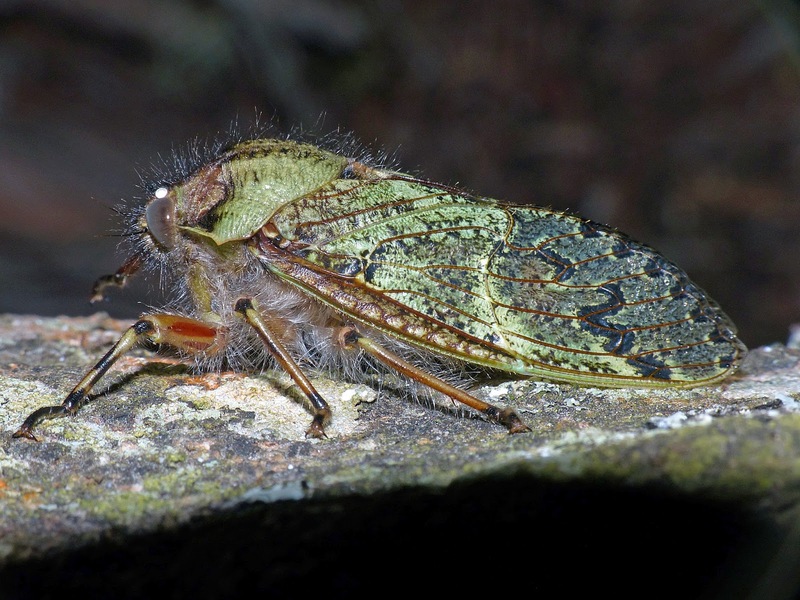 Hairy cicadas also differ from the remaining cicadas in other ways, most notably in lacking the well-developed tympana on the underside of the abdomen that typical cicadas hear with (hairy cicadas have simpler hearing organs in their place). As a result, Tettigarcta is placed in its own distinct family, sister group to the remaining cicadas in the Cicadidae. Though now restricted to Australia, fossil species from the Mesozoic and Palaeogene of other parts of the world have also been placed in the Tettigarctidae (Shcherbakov 2008); however, they are mostly so placed on the basis of shared primitive rather than derived features and may well represent stem taxa for Cicadoidea as a whole. Other derived features of the cicadas proper in the Cicadidae include gas-filled chambers in the abdomen that resonate the calls produced by the tymbals. In males of another Australian species, the bladder cicada Cystosoma saundersii, these resonating chambers reach a remarkable size and the entire abdomen looks to have been blown up like a beach ball. 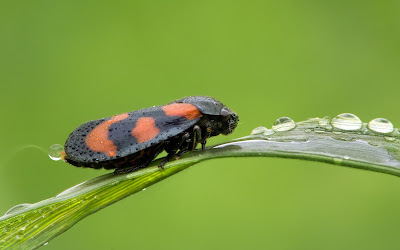 Froghopper Cercopis vulnerata, copyright Richard Bartz. The spittlebugs or froghoppers of the Cercopoidea are smaller cicadomorphs, distinguished from species of the Membracoidea by their short and cylindrical (rather than long and quadrate) hind tibiae. The name 'spittlebug' refers to the nymphs of these bugs living covered with a protective covering of foam. In one family, the Machaerotidae, the nymph produces a calcareous tube around itself that it fills with fluid. The foam or fluid used for protection by cercopoids is primarily composed of the nymph's own excrement: the xylem fluids that they feed on are mostly water, after all, so they produce a large quantity of watery excreta. Mango leafhopper Idioscopus nagpurensis, one of the world's many, many species of Cicadellidae, copyright Arian Suresh. 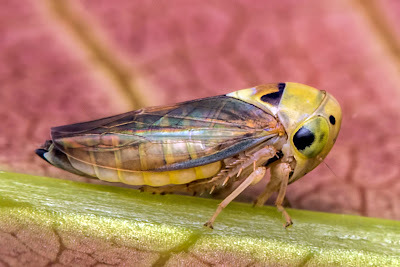 The third main subgroup of the cicadomorphs, the Membracoidea, is by far the most diverse, particularly the largest family Cicadellidae (leafhoppers). My own impression from my experience of collecting insects in various locations is that cicadellids are just everywhere. Over 20,000 species of this family have been described to date, and it has been estimated that the true number may be much higher. For instance, at one location in North America close to 100 species of a single genus Erythroneura have been recorded from a single plant (Dietrich 2002). Just how such a high diversity of closely related species can live in such close proximity remains a largely unanswered question, though some studies have apparently suggested the possibility of very fine micro-habitat partitions (making sense of the great mass of cicadellid diversity is not helped by many species exhibiting dimorphism between flying and flightless forms, similar to that I recently described for delphacids). 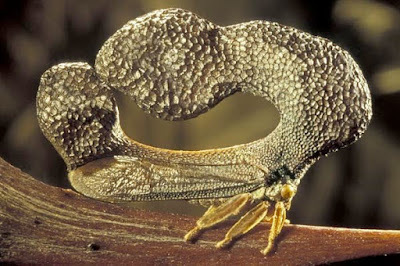 Another notable feature of cicadellids is the protection of brochosomes, tiny, hollow, soccerball-like granules constructed of protein nets with which the leafhopper coats itself after moulting. The hydrophobic brochosomes help to keep the hopper free of water droplets and its own wet, sticky excreta. They may also serve other protective functions: females will coat newly laid eggs with a layer of brochosomes that may serve to prevent egg parasitoids such as micro-wasps from attacking the eggs. Membracid leafhopper Cladonota benitzei, copyright P. Lahmann. The membracoids also include the Membracidae, renowned for the remarkable appearance of the pronotal shield (the top and front of the thorax) in many species. In more humble membracids, the pronotum may form a high mound or pillar, but in others it may extend into bizarre arrangements of globules and branched spines hanging above the leafhopper like a baroque chandelier. Again, just what the purpose of this extravagant morphology is remains unknown but many authors have proposed some sort of protective function. It has been suggested that pronotal projections may help membracids mimic part of their host plant, or potential predators such as parasitic wasps. Alternatively, they mean that potential predators such as birds find the hopper just too hard to swallow. Dietrich, C. H. 2002. Evolution of Cicadomorpha (Insecta, Hemiptera). Denisia, Neue Folge 4 (176): 155–170. Dietrich, C. H. 2005. Keys to the families of Cicadomorpha and subfamilies and tribes of Cicadellidae (Hemiptera: Auchenorrhyncha). Florida Entomologist 88 (4): 502–517. Shcherbakov, D. E. 2008. Review of the fossil and extant genera of the cicada family Tettigarctidae (Hemiptera: Cicadoidea). Russian Entomological Journal 17 (4): 343–348. Does that mean from a single type of plant, or from a single individual plant? Huh, good question. The original quote from Dietrich (2002) is, "For example, Hepner (1976) noted that as many as 100 Erythroneura species may occur together on the same plant." I originally read this as being the same individual plant, but now you mention it, just the same plant species might be a bit easier to swallow. Pretty incredible, either way. And now I've found the original source: "on occasion, more than 100 different species of Erythroneura have been collected from 1 plant in a matter of 10 or 15 minutes". Even allowing for the possibility that some of those might be morphological variants mistaken for distinct morphospecies, that is an absolutely mind-boggling number. Hepner, L. W. 1976. Fifteen new species of Erythroneura (Erythridula) (Homoptera, Cicadellidae), II. Florida Entomologist 59 (3): 293–300.